Music - music helps so much! It helps to get lost in the music a dark November day when I'm on my way to school or at home. 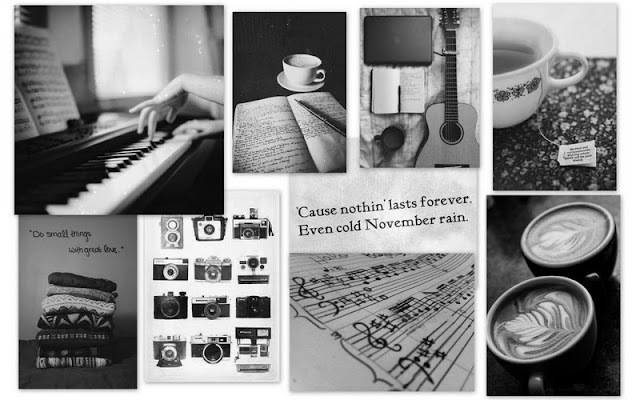 I have my autumn playlist that I have on repeat including songs from both old artists like The Beatles, Marilyn Monroe, Judy Garland and Billie Holiday but also from artists like Ed Sheeran, Ellie Goulding, Bastille, Lorde and Birdy. I also listen to a lot of movie soundtracks, like the soundtrack to Lord of the rings, Harry Potter, Downton Abbey and songs from a lot of musicals. Tea - I drink so much tea this time of the year. It just helps me relax and it's just so cosy to wrap your hands around a hot cup of tea a cold November day. Me and Eline actually have a supply of tea in our lockers in school so we can our little tea time in school every day and it at least makes our school days a little bit easier and nicer. Good books - reading is one of the things that always makes it easier to get away from life. It's one of the best things to sit a read wrapped in a blanket with a cup of tea when it's autumn. Musicals - I just LOVE musicals and always have. Musicals always makes me happier and I just love to sing along to all the songs. A few of my favourite musicals are Sound of Music, Les Miserables, and Chicago. Scented candles - I really like scented candles and as soon November comes I start like my own candle therapy which includes using a lot of candles trying to not notice how dark it gets really quickly. Chocolate - do I need to say more than that chocolate is one of the best things ever invented. Writing - I just feel like I have a lot more inspiration and time for writing in the Autumn and it's just really nice to write either it's a novel, a poem or just some thoughts. Friends - Hanging with my friends makes November a lot funnier. Having movie nights, meeting for coffee, going shopping or just chilling. Cosy sweaters - I just love autumn clothes like big cosy knitted sweaters and knitted scarves. Nail polish - to paint my nails in in autumn colours like red and orange always puts me in a better mood. Coats - I love to get my warm coats out to use them when it gets colder outside. Going to the movies - I love going to the movies and I do it quite a lot. It’s just one of those nice things that you can do inside when its cold and rainy outside and were you can eat sweets without feeling guilty. This month I'm going to see Catching Fire at least three times (I'm so exited!!) and probably some other movie too. Tv shows - I watch a lot of Tv shows in the autumn, like Downton Abbey, Pretty Little Liars, New Girl and House of Elliot. It helps me relax to watch some episodes of a Tv show when I come home from school or on the weekends. So that was my list of things that will help me get through November, maybe some of these things will help you too. Sooo exited for Catching Fire! !